thank you to everyone who supported our 2018 charity run. let's come together for a great cause. Join us for our annual charity trail run that supports the Kelowna Food Bank! This is not a race and this run is all about coming together to support a wonderful community cause while sharing our passion for the outdoors and trails! You can choose from the following run groups and the wonderful PACE run leaders will be ready to take groups on a fun adventure at Knox Mountain Park. After the 90min workout, we will return to Red Bird Brewery and folks have the option to stay for lunch and purchase tacos from the Surf Side Taco Truck and craft brew from Red Bird. 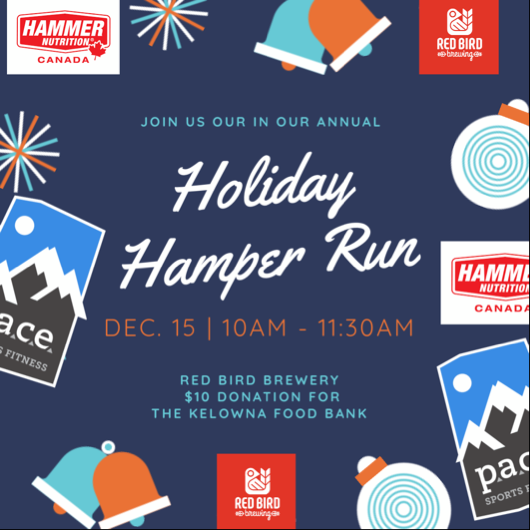 You're encouraged to dress up in festive colors and those who do, will have a chance to win some prizes from P.A.C.E., Red Bird Brewery + Hammer Nutrition Canada. Arrival - 9:45am to sign waivers & donation collections. Draw prizes: chance to win for those who dress in the festive spirit! *please note we are not collecting perishable or nonperishable food items. Cash or cheque only please. Thank you. Registration for our event is now closed. Thank you to everyone who is joining us! See you there!